"If we remember everything, we'll live like wolves." Russians proverbially like to do it up big, from their books to their movies. Mikhail Sholokhov's Nobel Prize-winning novel, Quiet Flows the Don consists of four massive books, and this second cinematic adaptation, made under Sholokhov's supervision, uses a full three movies to tell its epic story of the Cossacks in the early 20th century, and the impact that the First World War and the Russian Revolution had upon them. The story focuses on the Melekhov family in the Don river valley. The men are part of the proud and militaristic Cossack tradition, while the sturdy women labor hard. The patriarch of the family, Panteleimon (Daniil Ilchenko) is displeased that his younger son Grigori (Pyotr Glebov) is dallying with the married Aksiniya Lekatova (Elina Bystritskaya), and forces him to marry the beautiful but delicate young Natalya (Zinaida Kiriyenko). This doesn't stop Grigori, however, and he runs off with Aksiniya. Before long, war comes and Grigori and elder brother Pyotr (Nikolai Smirnov) willingly volunteer to serve. Political considerations intervene, and the family finds itself tossed on the waves of history as the Revolution and Russian Civil War turn friend against friend, family members against each other, and the traditional Cossack way of life is annihilated. The three movies are quite different in tone and substance; the first is devoted almost exclusively to the romantic dalliances of the central triangle and its aftermath, while the second focuses on the wars. The third continues with the civil war and becomes more expressly political as the White and Red forces are pitted against each other. Grigori, much as he goes from woman to woman, vacillates from side to side in the central conflict: first he fights for the czar, then becomes a Bolshevik, and then fights for the White forces, and finally fights for nothing other than Aksiniya herself. Glebov plays him as being not in control of himself in both respects, carried along both by love and historical forces rather than acting upon them of his own free will. Even when he does take action on his own, the result are invariably disastrous, making the story have an air of predestination. Glebov is fascinating in the lead role, initially seeming to be only an ill-tempered, violent and impassioned lout. But as the tale continues, he gets ever more depth, especially after he attempts to reconcile with Natalya. He expresses interest in politics, but doesn't seem to have an awareness of the consequences of his sloganeering. The stout Bystritskaya seems like an unusual choice for a romantic lead, but she imbues Aksiniya with plenty of character, as opposed to the rather colorless, if more traditionally attractive, Natalya. The two central actors offer a sense of Slavic warmth and passion, with all the violence that this might suggest. Quiet Flows the Don is sometimes referred to as the Russian Gone with the Wind, and this presentation certainly makes the comparison apt. Central romantic triangles, the turbulence of a life-changing civil war and a complete change of a way of life are certainly similarities, though the parallels are limited. One of the most notable sequences portrays a futile charge of the Cossack cavalary, armed with lances, against a German machine gun nest; the change of the Cossack way of life as it comes into brutal contact with the 20th century is continued as the Civil War and the demands of the opposing forces decimates the male populations of the Cossack villages. It's interesting that Gerasimov was able to make a movie such as this during Khruschev's rule; there is certainly plenty of criticism of the early Bolsheviks for wanton violence and cruelty, as well as the use of state political power to satisfy petty grudges, as seen in one of the Melekohv family's relations who executes Pyotr and persecutes Grigori. The epic scope and sweep of the movie does tend to carry the viewer along, even though it can be somewhat impenetrable to Western eyes at times. There is a certain amount of familiarity with the novel assumed, and the characters are seldom given proper introductions. Close watching is therefore rather a requirement of the first hour or so, in order to sort out the various relationships. The switches of political allegiance in the latter parts are often confusing as well. But the experience is rewarding, with plenty of satisfying action and romance keeping the program compelling throughout its daunting length. The ethnographic detail is often fascinating, and often the textures of life amongst the Cossacks are so engrossing that the picture is quite watchable solely from this perspective. Image Transfer Review: The package indicates that the film is presented in its original full frame ratio; however, it feels uncomfortably cramped at the sides making one wonder if it hasn't been zoomed somewhat. Most offerings from the Russian Cinema Council (Ruscico) have been pretty shabby, but this is for the most part much better than one might expect. Part 1 looks reasonably good, with decent color and a sound print. It does tend to be quite soft and dupey, lacking in fine detail, though it is reasonably clear. Color is quite unstable in the second part, and sections have serious scratches visible. Part 3 is faded to yellow for the most part, with very little blue remaining in the picture. Some very minor conversion artifacts are detectable when stepping through frame by frame, but they don't appear to make any visible difference when viewed at proper speed. Audio Transfer Review: The film is offered in both the original mono Russian (recorded live, with all the limitations that suggests, but still giving it an authenticity often lacking from Russian movies) and 5.1 versions in Russian, English and French. The mono is generally preferable, since the 5.1 tracks add in numerous extraneous effects that seem slightly out of place, especially in the more pastoral sequences. The 5.1 track does sound reasonably good during the battles in the second and third parts, however. The English and French tracks are not dubbed, but are voiced over by a single male and female voice, lacking in any emotion. This makes the picture rather difficult to enjoy and I'd recommend the original Russian mono under just about any circumstances. Don't expect significant range, and it's quite acceptable. Extras Review: An ample supply of bonus materials are presented in this four-disc set, starting with menu options available in Russian, English and French, as well as a dizzying array of subtitle options. Disc 1 includes a fawning text essay on Sholokhov, as well as a photo gallery and a still gallery which appear to be mislabeled since the still gallery features 25 behind-the-scenes shots and the photo gallery contains about a dozen stills and poster designs. Disc 2 includes bios and filmographies of Gerasimov, cinematographer Vladimir Rapoport, composer Yuri Levitin and production designer Boris Dulenkov as well as a text bio of Sholokhov. The third DVD includes brief bios and filmographies for 14 cast members. The meat of the extras are on the fourth DVD (most of which are also subtitled), starting with newsreel footage of Sholokhov receiving the 1965 Nobel Prize (1m:35s). There is a period Making of (10m:32s) that includes quite a lot of behind-the-scenes footage, not least of which is a discussion between Gerasimov and the actors about the subtleties to be played in a particular sequence. The current head of the Cossacks, I.A, Kononov, offers a history of the Cossack people and their traditions (13m:30s)that helps clarify many of the things seen in the picture. Elina Bystritskaya offers a series of recollections (9m:38s), including Sholokhov personally approving the major casting of the picture. Zinaida Kiriyenko provides an even more expansive set of anecdotes, filling 24m:33s of quite enjoyable tales of the filming of the movie. If you're only going to view one extra in the set, this is the one to visit. 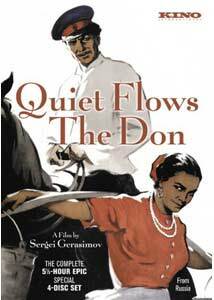 Nearly as interesting is The Truth about Quiet Flows the Don (16m:39s), which deals with the plagiarism controversy that plagued Sholokhov for nearly fifty years, until he was finally cleared with convincing finality in the late 1980s. For those interested in the Cossack song and dance, a stage performance of four pieces (18m:41s) provides a colorful look at their culture. Alas, the songs are not subtitled, so most viewers will be unable to appreciate the texts. The package is wrapped up by four trailers for other Russian films, two of which are lacking voiceovers and text, making them seem to be random snippets of the movie, interrupted by black screens. A sweeping portrayal of the end of traditional Cossack life, with an unusual central romance. Although the transfer is somewhat lacking, there are plenty of extra materials.